In the world of construction, quality assurance is becoming almost as important as project safety in gauging the success of the project. I did say ALMOST as important, because SAFETY is ALWAYS the number one priority in our business! 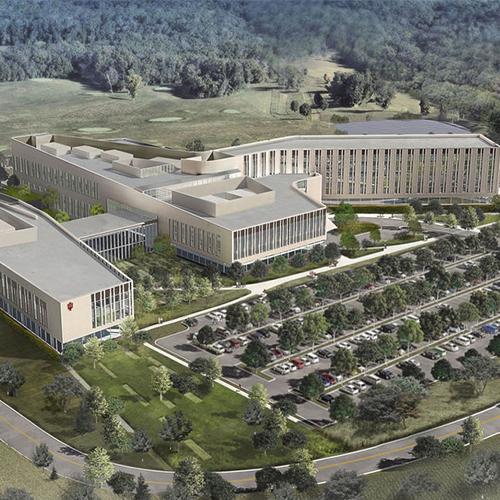 For the IU Health Bloomington Regional Academic Health Center project, quality assurance is one of the construction management and owner’s technical representative team’s highest priorities. The Quality Assurance team of Joe Brown and Jim Ferguson (Anova) and myself, Jeff Johnson (F.A. Wilhelm), are focused on delivering a top-quality project for IU Health and the greater community. We pride ourselves on building the highest quality facilities we can. The quality assurance process is just one part of the construction management team’s responsibilities. We work hand-in-hand with the numerous trades that specialize in the installation of the differing materials and systems that go into a build of this magnitude. We carry out quality assurance efforts daily – whether it is reviewing a specification, installing a manhole, or finishing details in an operating theater. Each component of the trades work must be verified for material quality, proper placement, proper curing, proper function, and finish just to name a few items. Budget, schedule, and coordination of the building process are important to all building projects. But those priorities may be forgotten within a few years after completion. The quality built into the project, however, will live on and be visible for the next 50-100 years! F.A. Wilhelm, Anova, and up to 70 subcontractors including hundreds of tradespersons on the new hospital project will be diligently planning, organizing, monitoring, and controlling the quality of your RAHC every day. Please know that the quality control behind the walls and above the ceilings is executed to the same exacting level of detail as the work you see visibly. It is our team’s passion to build with the highest level of quality assurance.